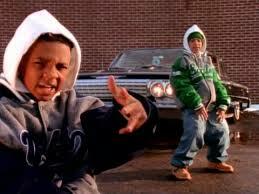 I am not happy about Chris Kelly, aka Daddy Mac, aka one half of Kris Kross, dying. Not happy at all. It's not because I was listening to Totally Krossed Out yesterday or anything, or that I've been spending the last 20 years waiting for a comeback. It's not even about the fact that, in the sixth grade, I wore my clothes backwards to school on several occasions. Or that Ben Yost's sister put my hair into tiny, tiny braids. Or that I also shaved stripes into my eyebrows. It's because he was 34. No one should have to die when they're 34. And nobody should have to grow up so fast that their best days all happen before they're even in high school.